As promised, the final Dwarf Fortress tutorial from me! That is, unless you demand more. In this tutorial we’ll cover some broader fortress design questions, stuff that I’ve previously forgotten to mention and thoughts about fortifications. Oh, I’ll do a wrap-up post with links to more resources some time after this post comes out. Ok! Lets get to it! If you’ve lasted this far you’ve had an excellent grounding in Dwarf Fortress. What’s more, you understand the concepts well enough that a bit of digging around DwarfFortressWiki.net will answer most of your questions. If the wiki fails, there’s always the Q&A forum over on Bay12 Games. But something that seems to stump a lot of people are the big engineering jobs such as digging pits, sorting defences, and building above ground. So lets get on with it and do some of that ourselves! We’ll do so in the name of choosing a new, more secure, more roomy entrance for our fortress. Lets see, I think about a screen north and a screen east of our main entrance is a nice, open, flat area, and one we could easily defend if we were to dig some passage down. If you think about it, wouldn’t it be cool to have the trade depot close to our big storage stockpile? Then our dwarfs wouldn’t spend too long hauling crafts and with the trade depot deep inside the fortress we could more easily defend it. So lets get on with it! Clear it of trees. About a screen full of clearing will be required. Go down a level and used “d”, “r” for “ramp” to set a 10-wide row to be turned into ramps. Now is a good time to remind you that shift+arrow keys makes the X move in blocks of 10. Here’s how mine is laid out, I’ve dropped the top width of ramps first so that I can check I’m happy with how it will be laid out. 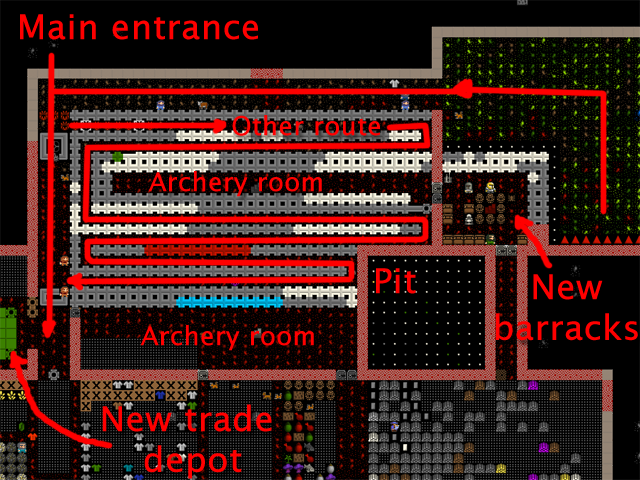 With the first level dug out we now want to go down another level, that would put us on the same level as the storage level, which would be a handy place to have an entrance huh? And we could move the barracks here as well, nice and close to the action, right? But before we do that, we need to remove the spare ramps. Those are the ramps which we don’t actually want to be part of the entrance slope. Hit “d” and “z” for “remove ramps”. You may have noticed we’ve got a dwarf stuck in our pit! Why? Because there’s no ramp or steps to get out! But now we can keep digging. So go down a level and again dig out the 10×10 below with ramps. For the L-shaped diggings, dig out athe level below, but be careful not to dig out the ramps we’ve left – otherwise you’re likely to get a cave in on our dwarfs and you’re also going to remove the entrance path we’re trying to create. Once you’ve gone down another level remove all the ramps in the L room except for, again, one line at the bottom. That way you’ve got a ramp going down to the first below ground level, and then another ramp going down to the storage floor level. That is, the two sets of ramps take you from the ground level down two levels underground. In the Pit, remove all the ramps and go down again, you’re aiming to be at the workshop level. Again, remove ramps at that level and connect up with the main workshop floor. Have a look at how my setup looks from the top down through to the bottom. 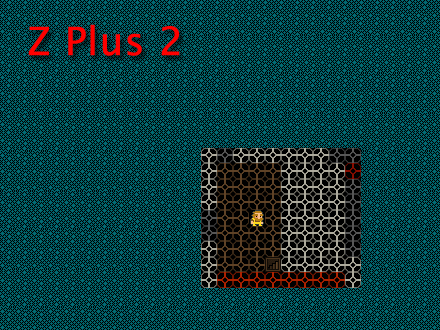 Note, the Z minus 1 level has a room dug out in the un-ramped corner. This room will overlook the entrance. That should give you a pretty good idea of the sort of digging we’ve done. As you can see, the pit goes down deeper than the entrance right into the heart of the fortress. We want this because this open air space means we can set a refuse pile down there and not generate miasma! Cool huh? Now our dwarfs only have to walk across the hall to drop rubbish in a secure place, rather than walking all the way up to the surface to drop rubbish outside, where it’s dangerous. You might also want to make some statues at a masons to place them in the middle of the pit and to turn that area into an statue garden (“q” over a placed statue). 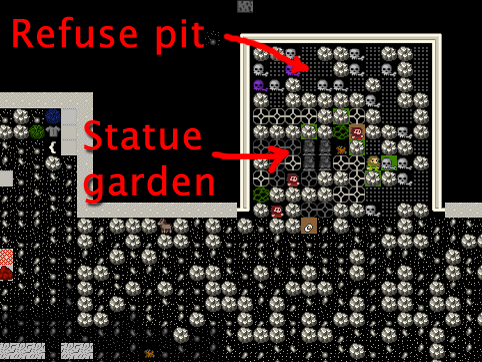 Dwarfs like to hang around statue gardens and since the bottom of that pit counts as outside it will help prevent cave adaption. You may be wondering about all the dug-out space. I set the crook of our L to be dug out as rooms for our soldiers to overlook the entrance. 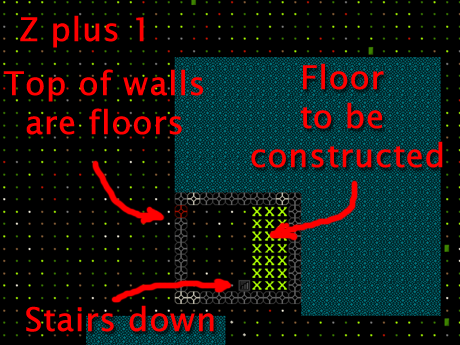 First the bottom room, (before digging steps up) and then the room above at the Z minus 1 level. I would have left the room walls up but then I remembered that those silty, clay walls can’t be carved into fortifications, so I had to dig out all the dirt. I plan to replace the dirt with constructed walls, which I will cave to be fortified. I’ll show you a couple of pictures when I’m done and you can try something similar. Hit “b”, “A” (or find “Archery Target” at the bottom). Hit “q” over the middle one when they’re built. Hit “r” for “Make Archery Range”. Look at the top right. You’ll see “Shoot from Left to Right”. Use WASD to chose the proper direction. For me, I want them shooting down (from where the dwarf is in my picture) so I hit “s”. Job done! Range is now ready! Now we need some soldier types! Go and make a new squad of half-a-dozen slackers. Set them to be equipped in leather armor only. Now, go and make a bunch of useful items! Like crossbows, perhaps steel ones. Make some steel bucklers as well (that’s a small shield that can be strapped to ones arm and doesn’t slow one down as much as a shield does). Go to your leatherworks and queue up some more backpacks and add some quivers as well. Make some more assorted steel armor bits. Let your archer dwarfs skill up a bit as wrestlers. Strong and tough dwarfs are always good. You will need to keep them supplied with bolts. You can make wooden ones at a craftsdwarf’s workshop (and these are used for practice) and bone ones there as well (for fighting with). You can also forge metal bolts, which are better, but at 25-or-so bolts per steel bar, it gets a bit costly. At least they will only be used in a fight when it really counts. Now you have marksdwarfs! Over time they will be awesome shots, and fire quickly. They will be useful in firing through our fortifications that overlook the entrance L. If you look at the picture below you can see how I’ve put in double-thickness walls that have been carved with fortifications in areas I want me dwarfs to be safe in. I first put in one wall, carved it, then another. Double-thickness walls keep the enemy a bit further away and makes it harder for them to shoot in at us, while we can still shoot out just fine. Also in this picture can see the general layout of my new entrance. The pit leads down to a passageway into the fort and to the new trade depot. Along the way to the depot are two bridges. At the first sign of invasion I pull the lever to the first bridge, now the only route to my fortress is that long winding path which is bracketed by two archery rooms. I can park dwarfs in those rooms and they can shoot through all those fortifications to hit the various invaders. Along that long and winding path I am also constructing a lot of traps. It will be very hard for any bad guy to get far, with luck! Further, about half way along the final straight to my entrance I’ve put a pressure plate linked to last bridge. The pressure plate is set to be one-use only, and when stepped on, it triggers the final bridge (if it wasn’t one use only the bridge would open and close every time it was stepped on). End result is even if the bad guys make it close to my entrance as soon as they cross that plate, up pops the interior bridge and we’re safe and they’re stuck! While this constructing has been going on I have been digging up some obsidian stone. 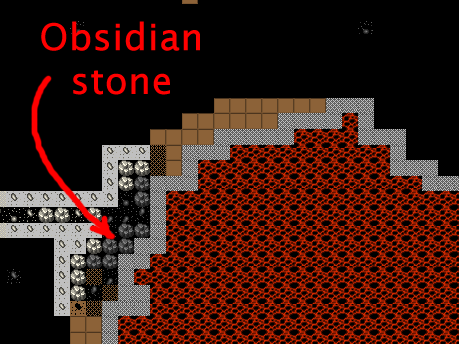 The obsidian can be found around the edge of the magma pool at all levels. Obsidian is going to be very handy! Why? Because when we go to the craftsdwarf’s workshop we can chose “Make rock sword” from the task menu. Obsidian short swords are as good as steel swords and they are easy to make. I like to use three of them in a weapon trap, very effective! Obisian objects are also more valuable than normal stone. You’d have to set the obsidian to be usable in the “z” “stone” menu, but once it is you could place a stockpile near a masons’s shop and using “q” on the stockpile, then “s” for “settings”, set it to be obsidian only and thus trick masons into using the obsidian to make some valuable furniture or crafts. If you try and dig out the obsidian you are likely to get a lot of “warm stone located” messages and have your digging stopped. Don’t worry if you do. Just set the stone to be dug again and carry on. As we can see all of the magma on the levels we’re digging we can be confident we’re not going to have magma burst in on us. I’ve gone ahead and smoothed the bottom of the pit, put in the refuse, and in one corner I’ve placed a few statues and set the area as a statue garden. While I was digging away downstairs I thought it might be nice to have a place above ground from which to shoot at invaders and perhaps somewhere to build some siege engines as well. Hence, I’ve started construction of a keep overlooking the entrance. In the picture below you can see I’ve dug a stair down to the level below (Which is hollowed out and walled in and has constructed stairs up) and I’ve put a wall around this area. Now, I could go and set these ground floor walls as fortification, but I prefer my archers to shoot from above the enemy. It makes them much harder to get shot in return! So, instead of fortifying this level I’ve constructed another stair upwards. 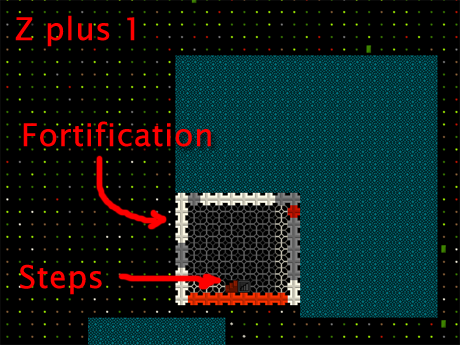 As you can see below, on the level up, I have matching down stairs constructed and thus now have access to this level. If my dwarfs wanted to go up here they’d have to walk on the tops of walls (walls come with a floor and a ceiling component, by the way, so the top of a wall counts as a floor). But wouldn’t it be better to have some floor? Yes! I agree! So I’m using the build, construct (“b”, “C”) menu to set a big floor to be built. Eventually I’ll ensure the whole area is built over. But, if you do the same, do not put a floor over a wall top. This will prevent you from building a wall on that space. Walls can never be built on top of another construction. So leave the wall tops free and a wall all the way around on top of your existing walls. We’re building a tower you see! Also, make sure you leave one space clear of floor. This is where you can “b”, “C”, construct another set of steps going up. The picture below shows the floor built with fortified walls around the edges. This will be a great place for our marksdwarfs to stand and shoot at any invaders as they approach the fortress. You can also see another set of steps I’ve built going up. And here’s the floor above. No walls, a smooth surface. Ready for me to put siege engines on, perhaps. And for a special treat here’s a screenshot from 3Dwarf Visualizer, which is a third-party tool which roughly displays how your fortress looks in 3D. you can see the entrance (but from this angle, not the ramps down), the keep and the pit. And welcome to the end of the tutorial! By now you should be able to play the game on your own. If you’re lost as to what to do next, how about digging around and looking for more ore to smelt? How about building a well so any injured dwarfs can be brought water more safely? You might also build a shop as part of your dwarfen economy, or consider a mega project like an enormous tower, castle, or a fortress entirely surrounded by magma. What about a stupid dwarf trick such as a drowning chamber or a booze bomb? There are many options, and just surviving the increasingly severe raids from goblins and other critters can be a challenge. Good luck! And thanks for reading this far! I will do one more small update with links to more resources. See you then. Please do write some more – this has been superb. Thanks! Anything in mind you’d like to request? I might do a followup and knock off a number of topics all at once. Maybe some things on location specific stuff? I don’t think you’ve covered suvival techniques on deserts, glaciers and seasides for newbies yet. Blimen heck! That’s quite a list! Hehe. I’ll have a think about it. The DF forum remains probably the best place for this sort of advice but if there’s demand I could whip something together. Thanks for the tutorial! I’d like to see some item management tips. I’ve got storage rooms filled with weird clothes and ropes, not to mention the clothes strewn around my gay bathouse/barracks. Do my dwarves sort through that stuff and wear it automatically? What’s the best way to make sure they’re wearing only the finest garb? something on pumps and windmills would be nice, the wiki doesn’t really explain them very well and I seem to have some kind of mental block to figuring them out myself. Also I have been ecstatic lately. I have admired a fine tutorial recently. Now for that drink. In that build, a wall around the garbage pit at ground-level would be a good idea. That way a squad of goblin bowman can’t come along and take potshots down into your fortress. Those protective walls would make it harder for your marksdwarves to take shots at enemies coming from the southwest, but I think it’s worth it. Good point! I had forgot to mention that putting walls around your pits is a nice idea. Even part-walling your entrance pit is a good idea, stop gobos standing on the edge and pew pewing down on fleeing dwarfs. Nice tutorials, buuuuut there’s a couple of things you could clear up. For instance, check your archery range, are the marksdwarves only using the target designated as an archery range and no others? If so, you will need to designate EACH of the targets as an archery range, that way they’ll all be used (at least it was like that in a prior version, don’t know if it changed now). Also a handy tip you didn’t mention in a previous tutorial concerning bar stockpiles. Rather than using k to look through all the bars to see how many you have (which you suggested at the time) you could just use b and then B to build verticle/horizontal bars, which will bring up a list with numbers of all the bars you have in your entire fortress (including soap). A very quick way of finding out you are down to only 3 steel bars. Still loads of great info though, perfect for anyone who still finds dwarf fortress hard to get into! Good job and please write more, glass for instance or keeping animals such as cows for milk/cheese (something I’ve yet to do, I bought a load of cows from humans and when I examined them in their cages they were all bulls! Not the kind of milk I was after!). Esto está siendo traducido al español por Haplo y otros. Espero sinceramente que puedas encontrar tiempo para ampliar el tutorial. Yo todavia voy por la parte 6, pero es fenomenal. Para ti mis agradecimientos y un aplauso. What may be most useful might be a short follow-up regarding where players can go from here. DF can be an overwhelming game, even if you’ve had a thorough introduction such as this. A long list of simple keywords to intrigue new players may suffice in tempting them to check out the wiki pages if nothing else. Topics such as dwarven justice (hammerers, sheriffs, prisons, failed mandates, fortress guards), the dwarven economy (coins, rent, room and item value), engineering (windmills, water wheels, driveshafts, screw pumps), or endgame content (the dwarven king, fortress upgrades, and secret fun stuff). There are also tangential topics that new players may not even be aware of, like the world generator, picking a site for a fortress, and, most of all, adventure mode. Oh, and it might also be prudent to mention that DF is an incomplete work that is constantly being improved by a single man, and that single man makes a living off of donations from DF players. It’s pretty staggering to take a look at all that he’s done so far and then consider all that he has yet to implement, if you take a bit to browse through his “to do” pages. Also, the bug reports are often hilarious. Something bug me however, you don’t seem to speak about the Manager screen (http://www.dwarffortresswiki.net/index.php/Manager), which is extra handy ! I’m sorry if I just missed it in the pages. Oh yes! Manager! Forgot about that because I don’t use it much. Will see what I can do with some followup work. Something to considering talking about in your follow up (which I really hope you do) is what to do about thieves. I’ve got a kobold thief in my fortress and I haven’t the slightest idea of what to do w/ him. Thanks for the tutorial. As someone else said, it’s the best one I’ve found yet. In a cage? Making a room and filling it with Goblins and trapped creatures can be quite a laugh. Serves no purpose, but it is funny. I’ll have a think about it. Hey, this was superbly written I must say! A fun read, even for an experienced player. Dropped a note about your great pack in the first post and in the post-tutorial links post as well. Thanks a lot for all of your awesome work! Add me to the list of people who found DF completely impenetrable the first time I tried it. I thought it was some strange sort of party-based roguelike. But WOW the possibilities are endless! The micro-management gets a bit too much for me I’m afraid and with about 50-odd dwarfs I find myself regularly stuck with about 20 idlers constantly throwing parties. I need a lot of practice optimising my workforce with the Dwarf Manager I guess. It is thoroughly addicting watching the little guys buzz around like a colony of ants though. Thanks for the tutorials! My understanding of fortifications is that they are more likely to block a shot the further away the shooter is from them; they should be built next to where your guys stand, and as far from the enemy as possible. So, I’m not sure your double-fortification scheme gives your archers the differential advantage you’d be looking for, since the enemies’ path will take them right next to the fortifications. Your guys would stand adjacent to one fortification and one square away from the next, but the goblins would also stand next to one and one away from the next, meaning that any crossbow wielders among them would have a “fair fight” firing into the archery rooms! Whereas, if the goblin-side of the double fortification was a channel instead (for example), then your dwarves would be right next to the fortifications and the goblins would be an extra square away, so the structural advantage would go to the dwarves. Of course, melee goblins would be sitting ducks either way, so this isn’t a fatal flaw by any means. You raise a few very good points! As we all know, playing Dwarf Fortress gaming is a constant learning process! As for the siege engines, I believe they (like marksdwarfs) can fire to multiple different Z-levels, but with Balistas you want to be firing on the same Z-level as one balisata bolt can fire through multiple bad guys! Or something. Worth trying yourself and seeing what happens, folks! Also, I think siege engines can only hit targets on the same Z level, so the roof of a tower is probably not the best place to build those. Frankly, though, marksdwarves are so much more versatile in terms of positioning and aiming that I haven’t found much use for siege engines yet. Maybe if I’m ever sieged by multiple squads of zombie dragons I’ll finally need that much firepower. But listen to me nit-pick. Nice work getting more folks into DF! I’ve wanted to play DF for a while, but never found a way to get in to it. Your tutorials are as amusing as they are helpful. If you do another tutorial chapter, (and I’d LOVE for you to do another tutorial, as your perception of what true newbies don’t know yet and upbeat writing style have made this the first time I’ve actually gotten somewhere in DF!) it might not be a bad idea to give your fledgling chicks a little better chance of flying after you kick them out of the nest by covering how one starts a new game. This tutorial series starts with a world set up for easy learning, but eventually people are going to want to (or have to) start anew, and the first time I went in to do this, I was overwhelmed by the options and screens just for choosing a new site in the existing world and setting up my settling party. I ended up completely screwing over my subsequent fortress by choosing a very challenging location to live in without realizing I was even choosing that. And then it took me a long while to realize that my excavating was taking forever because only one of my party was allowed to mine by default, unlike in the tutorial. The “new game” controls and starting conditions are probably the last thing I need to understand better before I can really thrive, experiment, and die on my own. World generation and glass are high on my priority list, first I have got to conquer the med as the Barbary States in Empire: Total War! And then I have to write about it! Thankyou for the excellent tutorial my first fortress and everything is going swimmingly! I would also love a section on making a new game, I think i have the glass thing figured but im not sure I can access sand on your tutorial map 🙂 So might be a useful tie in with a new map creation guide. You use ramps to create a digging site, but when I last tried that, the ramps started collapsing, knocking my miner unconscious. Didn’t you have problems with that? 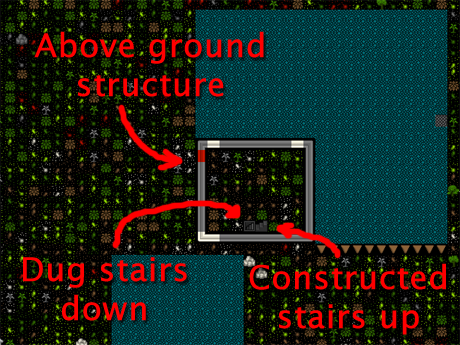 You need to “d”, “z” to designate the ramps for removal before you have more stuff dug under them. I have one question, Ive started a new fortress but there is no farmable soil inside the actual mountain, so I have to farm outside and you cant plant plump helmets outside, so what do I do? You need to go read about irrigation on the Wiki. It can be quite a process, but if you put in the effort you’ll survive fine. Until then you need a lot of people doing plant gathering and fishing. I’m really curious how you picked your plot. Tutorial on that coming after I clear some backlog. Keep your eyes open. Nikita: If you havent any other seeds cept plumps. Im guessing you could just gather plants for food/fish until some traders come, then purchase strawberry seeds from them and grow those instead. Im guessing you could build a pit as described in this tutorial to be able to farm your strawbs in safety. If you want to keep them safe while they drink, until they can set up a still, you might want to look up digging a well on the wiki. From some plants, but only when you use them for anything other then cooking. Eating, brewing, milling and preparing plants will leave behind seeds, but cooking destroys any seeds that a plant might produce. And any seeds from plants you gather from outside will only grow outside (for the most part). FINE and all, but my dwarfs all got thirsty and decided to walk to the fattest part of the river and get f*ucked up by salmon and drown. Neverminding crop irrigation and all, I don’t think you covered wells much. Or how I was supposed to get chains and buckets for the well…. Oh, they died horribly. I mean, where is cave spider silk =supposed= to come from though it seems to have appeared on its own? Mad clothiers. No dyer, the querns are rabidly unattended, they like to completely ignore the carpentry shops so they can bootstrap dwarfy chairs….oh, those buggers! Also, can you make another one which reads like a management book and uses more SQL? kthxbi. Aaaagh! The strawberries are causing madness! Cave spider silk will show up if you have cave spiders on the map (which you cats will eat if they find them). For the most part they require a cave, chasm or pit to show up. If you ever see giant cave spider silk be alarmed. It means there is a giant cave spider on the map, and for a giant cave spider, your dwarves (or pretty much any random large animal) make good snacks. Worse, they have the ambush skill, which means it will be invisible until it attacks something. Just started a game, and the before the first bit of the new fort was even dug, a GCS attacked some deer at a far corner of the map. Hopefully it won’t approach the fort any time soon, and might even make a helpful guard if any goblins show up. Thanks for the help! I’m at winter of my first year right now and doing pretty fine, but no immigrants are coming, is there anyway to trigger them? This fortress went to hell, one of my carpenters went insane and killed everyone, it said he was in a fey mood at first. I read on the wiki that that means he needs to do something at his workshop? All he did was hang out at the dining room until finally going insane. Hell? That sounds entirely normal to me! Remember, losing is fun! I had something similar happen to me. A dwarf went into a mood, but just sat there. The way to fix it, as I discovered is: Build more workshops. When a dwarf goes into a mood and doesn’t go anywhere, that means he’s looking for a workshop that you haven’t built any of yet. Mine went into a mood and just sat there, so I started building stuff. He eventually took off when I built a bowyer. And now I have a legendary crossbow. Just finished the write-ups. I have tried DF in the past but now finally I can play it. Great job, always looking for more though, Pumps, the economy, glass, and all those other billion workshops. Also if you want to change it I think there is a new version of the graphics package out. Thank you so much for a wonderful tutorial! I’ve been trying to get into DF for almost a year. Curse you for this tutorial! I can’t stop playing! And yes a tutorial about, world creation, choosing a location, windmills pumps and pipes would be great. No problem! Glad you’ve enjoyed it! I thought I’d try expanding on what you suggested in the magma tutorial, and needed some bauxite mechanisms to do it. I’ve locked an unfortunate mechanic in his workshop, surrounded him with a bauxite stockpile, and told him to make mechanisms like there was no tomorrow. I’ve just watched him meticulously pick every limestone rock out of the room and turn it into mechanisms. I had expected this’d mean the dim little guy would move onto the bauxite. But no. He’s refusing, cancelling the job immediately because he needs “non-economic rock”. I have surrounded him with bauxite! What gives? Hit “z”, then go across to “stone” and you need to set bauxite green by finding it and hitting “enter” to make it usable. Regarding the above, or the below, or wherever your comment appears in relation to this one: Thank you. You are a magnificently clever and wonderful person, much of which is reflected in this beautiful tutorial. Do dwarves only spar amongst others in their squad, or is there inter-squad sparring? I guess what I want to know is, when I make my third squad do I need to change all my champions to unarmed again so they don’t maim/kill my new recruits? hahaha I just asked this same thing on the military page. I unarmed them all and waited for the newbs to become champions, and thankfully wasn’t attacked in the process. Still waiting on my first raid. I’m sure it’s coming. Haven’t gotten thru this one yet, but seriously… thank you SO much for all of it. Even if you hadn’t kept answering questions (quite promptly, I might add), it would’ve been fan-frickin-tastic. The fact that you do answer the questions asked by us fledgling dwarf-mongers just puts it over the top. Awesome job, mate. Amazingly great stuff. No worries! You are all just lucky I have an iPhone and a long bus ride! I can’t believe this is the end! Every and any additional topics would be welcome. For instance – nobles. You cover them briefly and say that you’ll get back to them later. I understand there’s so much to this game that you couldn’t possibly cover everything you mentioned in passing, but they’re essentially a ready made list of new topics embedded in your posts! Thanks for all your hard work. I never would have gotten into this game without it. This is EXACTLY the kind of tutorial I’ve been needing ever since I started playing DF. I don’t know how many times I went to the DF forums or the wiki looking for some way to get my foot in the door of the game, only to be left more confused then before. After reading your guide in full, its all coming together now, and my joy with the game is only escalating!. As others have requested, I would love if you do decide to start covering more advanced tecniques and lesser known aspects of the game. I understand that as it is that could be very time consuming, but the way you explained everything thus far, it has been a joy to read, and very informative all at the same time! Almost as much fun to read as the boatmurdered saga that got me into the game in to 1st place! Thanks again and I cant wait to read more of your tutorials! Thanks a lot for this tutorial – I’d tried to play Dwarf Fortress several times before, but was completely failing until I read this. The information in the tutorial gave me a sufficient base to develop the fortress further (e.g., building a well system so my dwarfs stopped getting killed by fish). Bravo, and I hope you decide to continue! I was wondering what the best way to get cats are? I was fortunate that one of the immigrants brought one but I unfortunately got it killed with draw bridge squishing it. 😦 Poor bugger. Usually the best way is to buy them at setup – I’ll explain that in a tutorial later on some time. I bought one off a trader. They usually have a few animals in cages among a bunch of empty cages. If I might make a recommendation, covering well building might be a good thing to do before encouraging too much military training. Good idea! Will do after my next one. Fantastic tutorial managed to get close to the end had my magma pipes built and for some reason unknown to me the magma escaped and started to flood my fortress wiping out dwarves. Also in the save I now have all the living dwarves apart from one champion are unable to move and I can’t see any reason why. Even new immigrants are unable to move they just stay on the edge of the map. So guess that’s it as the champion won’t do any jobs. Can anyone explain what’s happened. I have a save if it helps. Have you set somewhere as a meeting area? Without a meeting area your arrivals don’t know where to go. Set one from a table I think, in a nice big room. Thanks for your reply as far as I know the dining room should still be set as a meeting place maybe its inaccessible I will have to check. Worked out what I did wrong with the magma I linked all three corridors to the magma instead of one as your example so that was my error I feel a total fool. Just ran through the whole tutorial again adding some of my own ideas and hopefuly this time things will work out better. One criticism is telling me to find the magma, then leaving it a long time before mentioning I’d have to deal with fire imps. Reload. heh. Also, regarding the magma flow, how come it doesn’t flow up the channels to flood everything? Since the top of the magma pit is higher than the magma grid, I thought it would have. 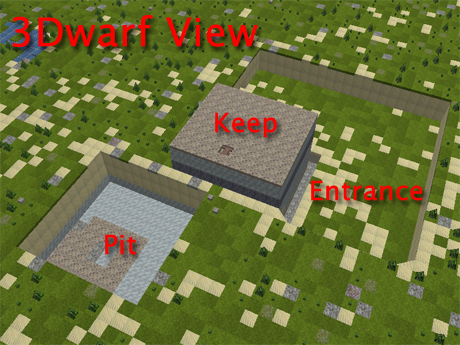 Is there a decent way to stop dwarves exploring certain areas? Rather like forbidding them to go outside, but mark a restricted area anywhere? Doors seem to be my only option. Overall, excellent tutorials. And should be enough to give anybody a decent start. Ooh, and I just noticed more, hurrah! Oh, apologies! The lava doods never bothered me at all! Awesome! Even though after a certain point, I kind of went off and did things on my own, this tutorial was a massive help, especially concerning the confusing squad creation thing. Why ramps to build the big open areas? Are they just easier to work with? Would channels have worked as well? Or do the ramps keep your dwarfs from falling down a level when they dig? I’m just trying to get a better understanding of what you’ve done. Thanks for that excellent tutorial. Without it, I’d be lost. Actually, I tried to get into DF some while ago -without your tutorial then- and gave up soon. Not this time, all thanks to you. One question concerning your new entrance in this tutorial: The extended route through traps and archery is great, but there’s one problem. Guess during an attack the dwarfs will walk through this tiny route (to haul or reload the traps), directly into the group of ambushers. I thought about channeling some space top of the inner bridge and the exit of the route, so this space is marked as “outside”. How did you solve the problem? Hope you will add some more parts to this tutorial, maybe something about justice and the dwarfen economy, power from windmills/water wheels and some words (more) about the food industry (What about the kitchen we built some tutorials ago?). Thanks, life is about to get verrrry busy (baby due in 4 weeks!) but I’ll see what I can do in time! I just wanted to say thanks for this excellent tutorial. It helped me out a lot, when I got started with DF, and I’m glad to see you’ve been expanding it since then. Haha, I love these tutorials. I tried playing Dwarf Fortress a while ago and quit because nothing made sense. Then I found your tutorial and now I’m addicted. One request though, maybe a tutorial/explanation elaborating on wells? The Wiki guide doesn’t seem to apply on this map (after much searching I didn’t find a good water source, and my dwarfs cant go outside because of a siege). This tutorial is very difficult to complete because while you do this your fortress will be attacked by thiefs who will start killing your dwarfs when your dwarfs try to protect the fortress, your dwarfs will go insane because you couldn’t kill an animal at butcher’s shop and provide some bones to your moody dwarfs etc. But after this tutorial (or just giving up after some pages) you will learn a lot about this game. It is best to just read after you complete around 6 tutorials. That is a good tip! This tutorial is very difficult to complete because while you do this your fortress will be attacked by thiefs who will start killing your dwarfs when your dwarfs try to protect the fortress, your dwarfs will go insane because you don’t know how to butcher an animal at butcher’s shop and provide some bones to your moody dwarfs etc. But after this tutorial (or just giving up after some pages) you will learn a lot about this game. It is best to just read after you complete around 6 tutorials. I, too, offer many thanks, oh great guru. I think I tried to get into this game once before, or maybe it was some other game. the experience of not having a clue about how to do anything if very familiar. I found recently a blogger with a cool narrative story about ow his game of Dwarf Fortress was going, and since the game is free I decided to check it out. I picked a good looking place for my fortress, near two rivers and some mountains, then placed my guys … somewhere that looked nothing like that. A vaguely hilly desert. Tried again. Got water this time, but after a few seasons it all went away. ???? I was about to move the whole thing to my recycle bin, but then I saw he had a link to an “excellent tutorial” that got him through the first 24 hours while the wiki was down. Excellent doesn’t do the work justice. It isn’t flawless, but it teaches all the basics, including what the crap on the map means. I look forward to a whole second edition, something like “More stuff you can do in Dwarf Fortress for the not-so-noobish”. I agree with others that Wells was an unfortunate omission: I got booze stacked to the rafters and my guys still insist on walking halfway across the map to argue with a fish over water rights, and frequently lose to him. He killed about a dozen guys, including my first ranger. So, I went to the wiki. When I tried to build a well, it said “needs chain or rope”, so I bought some rope from a trader, but it turns out it needs chain. And that needs a forge. Anyway, the wiki said your guys will only drink water if it is moving, or if it is deep. 7/7, whatever that means. So I figured to do a source that was both. I tunneled over to the river near the waterfall, then dug a short tunnel just below ground level on the high side of the waterfall, and a longer one on the level below that (just below ground at the bottom of the waterfall). I figured I would dig a channel to connect the top and bottom ends of my tunnels with the river, much like with the magma. Then I dug a deep spot: a small room under part of the long tunnel, doing down like three levels. I dug stairs down to the bottom of each pit, then channeled it out again. Then I went up to the top again (one level below ground at the top of the waterfall) and dug out my well room above the deep hole. Then I channeled away the floor so it would let me get at the water, …. and my two best diggers (including my Mayor) fell to the bottom of the well. One broke his arm in two places, on broke both his legs, bot of them were in bed for over a year (partly because the well wasn’t done). The peasant who broke their fall died. Anyway, I was very worried about accidentally flooding everything, so I put in a floodgate to shut of the water if it all went horribly wrong (activated by a lever FAR away, to buy time), and the I sealed the water channel behind a floodgate and went to dig my tunnels. The bottom channel let water mosey into the lower tunnel and fall down the hole. I was worried the water at the higher level might try to seek it’s own level, and overflow my well, but the wiki said water pressure can’t flow diagonally, so I cut a channel that just touched my tunnel at a corner. Presto, working well. PS: it might be helpful to know, for others who like me skipped the charcoal forge stage and went straight to magma, that you still need charcoal to make steel: it is both the fuel, and an ingredient. I had guessed this from actual steel production (it needs the carbon), but the wiki confirms it. Now to learn if I can save some trees by somehow using that bituminous coal I found. ! I’ve got one problem, one of my wrestler champions got badly injured, he actually has a spear lodged in his upper right arm, and he stays in bed all the time because of that. I’ve read op on wiki about that, so I bought some cloth and threads for dwarfs to bandage his wound, but they won’t do it. On wiki it says something about diagnostician etc skills/labors, but I can’t find them in dwarf manager. My champion has been in bed for a few years now and I would really like him back on his feet. What should I do? The new version has doctors, the tutorial version does not. Nothing but patience will help you, I believe. He may get better in time. Sorry! The wiki article is about healthcare in the current version. There was no such thin in the tutorial version. Only time and luck will see him get better. Make sure you have buckets and fresh water available so he can be cared for by other dwarfs. Oh, thanks. Shame 😉 And one more question, I tried making marksdwarfs, I drafted 4 guys into the military, let them wrestle a bit and then I got them into chainmails and put crossbows in their hands, everything seems fine. But one of them basically doesn’t like shooting, I think. He trained wrestling, but now, with crossbows, he sometimes stands near archery range and watches other train, but he won’t do it himself. I tried unarming and arming him again, didn’t work. Any ideas? Um…. no idea! Maybe he’s just grumpy. Give him an axe instead? Hehe. Has he got the right labors enabled? Well discovered! Damn sock wrestling dwarfs! Hello, I have come across the same problem, except with my hammer dwarfes. How do you make the person remove the (helm in my case) from their hand? Sorry, on the iPhone and don’t have a client handy, but you need to go to the info panel on the dwarf, then their inventory, then you need to scroll to stuff in two hands and use “d” for “dump”, I believe. That -should- solve the problem. Just gotta say, thanks for making this guide, without it I don’t think I would have ever managed to wrap my head around DF. You don’t know how many of my Dwarfs you killed with your slope mining method. Thank you so much for doing these tutorials and introducing me to this fantastic game! Just wanted to drop you a comment to say thanks for putting this together. It’s been invaluable to me in figuring this damn game out, and without having the step-by-step for some of the stuff you explain I could see myself constructing a window so I have something pitch my laptop out of… So, thanks! right after i finished the tutorial i had a HUGE fortress…but something terrible happened…i found adamant…and a THE BIGGEST PECULIAR CHAMBER EVER…i was pretty happy when i found adamant …but i opened the peculiar chamber and demons rushed into my fortress and i didnt have time to react…there were like 30 demons spawned every minute and the glowing pits were to many…how can i beat 300 demons? You have just found Happy Fun Stuff! Congrats! I had to abandon my fort. A great tutorial series, I’ve read it a couple times and continue to find the examples valuable. A thought about the trash pit is that flying enemies could come right in (hasn’t happened to me but I hear they can show up later on). Making 100 grates didn’t seem realistic, so my best thought so far is retractable drawbridges that can cover the hole. That’s a pretty good idea! Also, it’s possible that even if you put a floor over the entire refuse dump that the dump will still be considered ‘outside’. In my dream world you could set refuse piles over open holes and thus create an easy garbage chute without all the ‘dump zone’ hassles that you would otherwise have to go through to create a zone over a hole. Been playing for 2 years now (ingame) after this tutorial and not much has happend since then, was thinking about building an arena but how do i release any animals or goblins i’ve catched or move them to another position? P.S what is the population cap, i’m at 150 and i’ve pretty much stopt getting migrations even though my wealth is booming. Depends on .ini file settings. Check the wiki for where to find yours. 150 to 200 is common. Head to the wiki and read up about cages, and dumping creatures. The advice for the 2010 version is good. How do u let creatures out of cages?